Thank you for supporting team Flames! If you have a player on Flames, you may choose Local Pick Up at check out to receive free shipping and a team parent will deliver your order. (Please put the name of your player in the "special requests" area). Otherwise, your order will be shipped to you at normal shipping rates. 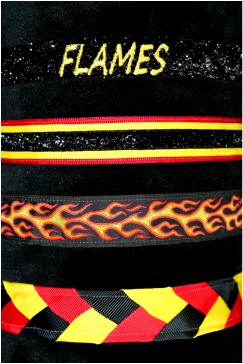 #1: 1/2 Black Glitter w/"Flames"